Set of 5 Mothers For All beaded stitch markers from Injabulo. Colourful little paper beads to decorate your work and help you along the way! 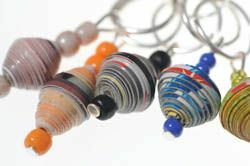 These stitch markers are produced by a South African womens project: Mothers for All, whose work supports women in Botswana and South Africa who care for children orphaned or made vulnerable by HIV and AIDS.